I sit in my kitchen sipping maple sap, staring at the landscape constantly transforming before my eyes while contemplating the spring equinox. During the past few weeks, I’ve experienced warm weather melting the blizzard’s huge snowfall, followed by a snowy weekend surprise totaling around 17”. Again the snow melted, bare ground appeared, only to disappear yet again under another white blanket. Winter never moves directly into spring. Seasons spiral in and out as we gradually cycle from one to the next. Longer days and shorter nights herald the coming of spring. Day and night are of equal length at the spring equinox, which marks the official start of spring. As I do each year before the spring equinox, I cut some forsythia branches last week, brought them into the house and placed them in a vase with water. Their forced yellow blooms now sit atop a counter in my kitchen – a tribute to spring. 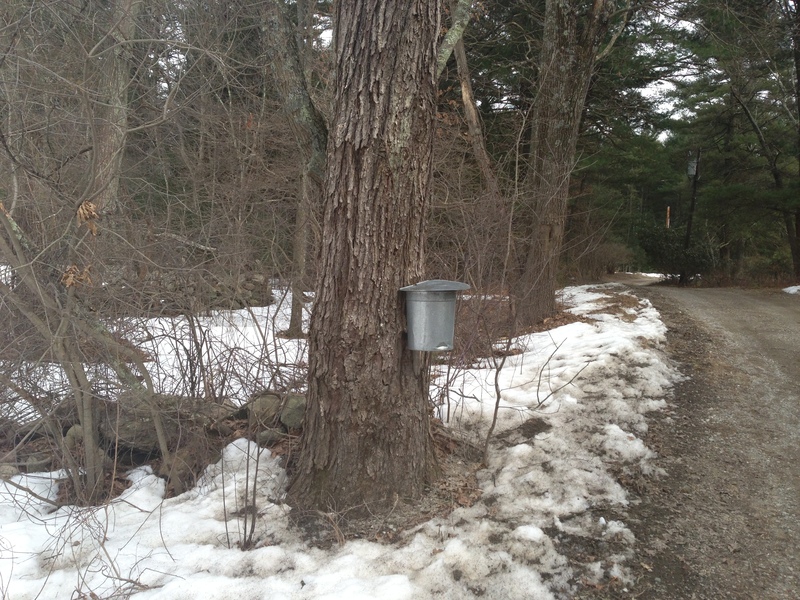 Prior to the spring equinox, we also gather maple sap from trees on our property. The sap can be boiled down to create maple syrup. Many years ago we once took on this project, only to realize its huge labor intensive and sap consuming nature. Many, many gallons of sap reduced to one tiny container of syrup. Our sap gathering equipment gathered dust in the barn until I learned about a traditional practice of drinking the sap without boiling it down. Consumed in this manner, maple sap is considered a spring tonic. Full of minerals, and other healing properties, tree sap helps us move out of the winter doldrums and experience the energy of sap rising within. Although Earth’s energy re-awakens with spring, winter’s lethargy still pervades my body, weighing me down and refusing to release her grip. As I sip on hot maple sap, I invite the energy of spring to enter my body. May I feel sap rise within me.